What’s a Happy Pizza? « Be Happy!…Be Encouraged! “Happy Pizza” is a Cambodian style pizza with Marijuana added to it. 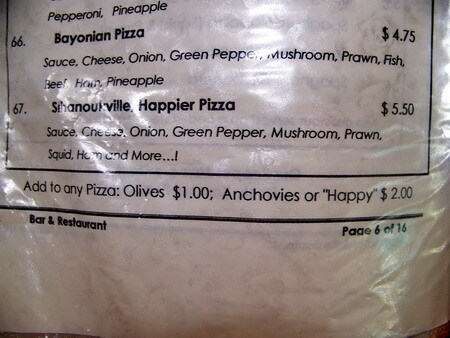 At “Happy Pizza” restaurants menus will offer pizzas with titles such as “Mildly Happy Pizza”, “Extra Happy Pizza”, and “Very Happy Pizza”. On the menu below notice the “and More!” part? That’s where the secret lies. Why do I use the handle “happy pizza”? Well, I think it’s a cool name and most everybody loves pizza! I also believe the Creator/the Life Force/God/the Great Spirit is a lot more happy, wild, free, creative, and loving than most religions make it out to be. I’d like to think that having a true dose of the essence and spirit of God is like eating a nice big piece of Happy Pizza (minus any adverse side effects of marijuana)! So feel free to have a piece of God’s “Happy Pizza” and get high on love, light and the goodness in life. Let the positive take you places you’ve never dreamed of before. PS: I know my style of writing is not to everyone’s liking (I’m anything but a writer) but hopefully some posts will encourage someone, somewhere in this big World. Posted by happypizza in God, religion, happy, happy pizza, happy pill, smile, spirit, encouragement, hope, positive, Cambodia, pizza, free spirit, wild, crazy. You guys think taking drugs is a good thing well think again, you might DIE! My son has been ill since he had an extremely happy pizza one month ago, it is so upsetting. please be careful folks! Coolest pizza i have ever seen !!!!!!!!! Use proper English its their not there !!! omg did you have and education ?? Happy pizza is banned. Unless you want to go to a Cambodian jail, it’s not worth it. 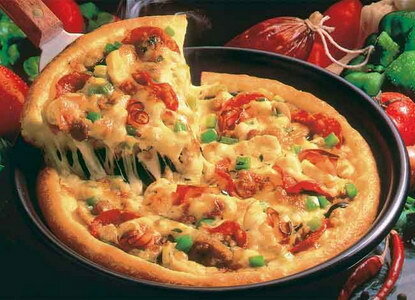 Pizza Hut is opening soon in Cambodia. Finally a good franchise. Pizza Hut is a good franchise? You’ve got to be high as hell or mental to think Pizza Hut is good, let alone an acceptable international representation of what pizza from american should be. I don’t care if its New York or Chicago its all better than some pizza developed so your most retarded citizens can easily reproduce for the cheapest overall cost to the franchise. That a factory not a kitchen. WOW! happy pizza hah ..
horrible, never ever in my live I’ve learned from it, never will take any drugs again, this experienced changed everything, after that i thought i will day, horrortrip next day everything was fine but after that a few days later it comes back and i had panic attacks for one year, and i wish these experience no one!!! Last summer my brother-in-law an I were fortunate to experience an extremely happy pizza. The pizza is very good, with or with the happy. We enjoyed extremely happy pizzas during our entire stay. We made frequent stops for pizza everyday. Let just say we were extremely content and very happy during our stay and enjoyed every minute of it. Perhaps some of you didn’t know what you were getting into. For the rest of us. Enjoy the bliss. I saw god on new years day. happy pizza all the way my friends!!! Go to Cambodia, help the people and get yourself a PIzza! Hello, just found your blog but I have to admit that it looks sweet. I totally agree with your post. Have a nice day, keep up the great work and I will definitely follow it. Hello. I don’t read many blogs, but yours is of thefew I follow.Have a great day! Hi, it is great post, and really useful for readers like me who are in require of info about it. Later i’ll often come to read your blog. My husband is there right now and texted me about them! found any interesting article like yours. It’s pretty worth enough for me. In my opinion, if all web owners and bloggers made good content as you did, the web will be a lot more useful than ever before. Thank you. Glad you like the content. I’ve been reading a lot about the legality of cannabis ’round the world, and recently I started reading about Cambodia. It seems the situation is really complex, with Wikipedia listing cannabis as “Legal/Essentially legal” (http://upload.wikimedia.org/wikipedia/commons/f/fd/World-cannabis-laws.png) but many other websites say otherwise, indicating some Cambodian Police will arrest those selling or smoking cannabis, while others will not, etc. Actually, I confused Bangladesh with Cambodia on that map, silly me! Belleville Happy’s pizza location has the worst service ever! All staff including manager’s need drug testing, seriously! Rotten customer service and begging delivery men, ridiculous! I dont believe, it exist in other country? !